The Iowa Great Lakes Rotary Club is excited to announce the date of its second annual Boji Brew Craft Beer Festival to be held on August 4th! Twenty craft breweries from around the region, including our two local breweries - Okoboji Brewing Company and West O Beer, will participate in the beer festival. Tickets are limited for the craft beer festival to allow ticket holders to have a relaxing and enjoyable experience to engage in conversation with the brewers and avoiding long wait lines to sample the beers. Only 600 tickets are available online: General admission tickets are $30 and VIP tickets are $45. 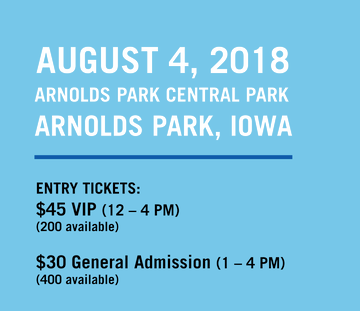 The event on August 4th will start at 12:00 noon for VIP ticket holders and 1:00 pm for General Admission tickets, and will run until 4 pm. VIP ticket holders will get an extra hour of sampling, in addition to some limited specialty beers the breweries will only offer during that initial hour. Proceeds from the Boji Brew Fest event will go toward renovations and improvements at Shelby’s Playground at Elinor Bedell State Park on East Lake Okoboji that are being spearheaded by the Iowa Great Lakes Rotary Club. The playground was built by the local Rotary club in 2000- 2001 to honor the memory of a young Spirit Lake chlld who died from abuse. The Iowa Great Lakes Rotary Club with the help of other partner organizations annually plant flowers, pull weeds, prune shrubs and provide general maintenance for the playground each spring. The money raised will go towards new equipment, benches,signage and other maintenance updates for the playground.